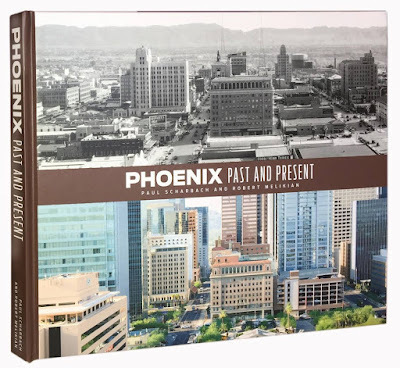 I collect old photos of Phoenix, and I give them away. I don't have them on paper, so I can give them away without losing anything myself. I can share them with thousands of people, and all it costs me is a small effort. I've been doing it for years, and I really enjoy it. And that's gotta be typical human nature, that a collection is only fun if other people can see it. And on the internet, there's no limit to how many people can share. So I give away stuff every day. And I really do enjoy it when I see other people enjoying what I enjoy. I hope that makes sense? But this past Thanksgiving I wanted to do a little more, and it struck me that I could actually give something tangible, so I'm giving my favorite book, Phoenix Past and Present. Yes, I'm gonna get myself another copy, don't worry about that! I think that I was inspired to do this by my Patreon patrons. If that's you, thank you so much! I support a few people on Patreon, and while it's only a few bucks a month, it makes me feel very good, and makes me feel as if I were doing more than just "liking". And as someone who just hates internet advertising, I'd also like to feel that I'm doing my little part to combat that. Please note that there are no ads on this blog - thanks to my patrons! So I started the big book giveaway by asking the group that I manage on Facebook what they thought about it. The response was amazing. At first I wondered if it should be some kind of a contest, and finally settled on a random drawing, which people entered by just leaving a brief comment. As an old Marketing guy, I often get suspicious about stuff. "What's the catch?" is what I often say, and look for. And there often is one. And then sometimes there's no catch - sometimes people enjoy giving. I gotta admit that I do, even though I'd never been known as someone like that in the past. It just feels good.